When Native Foods came to Chicago I just about peed my pants. However, after a few times there I became skeptical. How could this be healthy and fast foods at the same time? At home you have the control over what goes in your body. Since the NF website says jack about the food being organic I’ll also assume Native Foods does not use organic kale, etc. Did you know kale that is not organic is now on the Dirty Dozen PLUS list? -Pronounced “go-ma-shee-o”. This Japanese condiment made by grinding equal parts black sesame seeds and sea salt or can be purchased in the Asian section of Whole Foods. Cook 1 cup of dry quinoa in 2 cups of water by first bringing to a boil, covering, and then simmering for 20-25 minutes or until water has been absorbed. Meanwhile in another pot steam cubed tempeh for 5-10 minutes. Blanch the kale by bringing a pot of salted water to boil, immerse leaves, turn off heat and let sit for 3 minutes. Then drain and put in an ice bath for a minute. Drain again and thoroughly squeeze all water out. Coarsely chop. 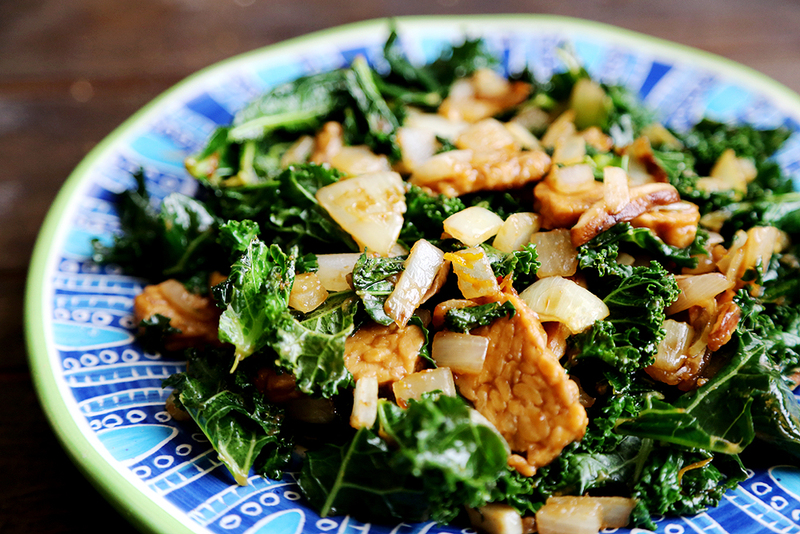 Toss tempeh, kale and sauce in a bowl. Serve with cooked quinoa, sauerkraut and gomashio.